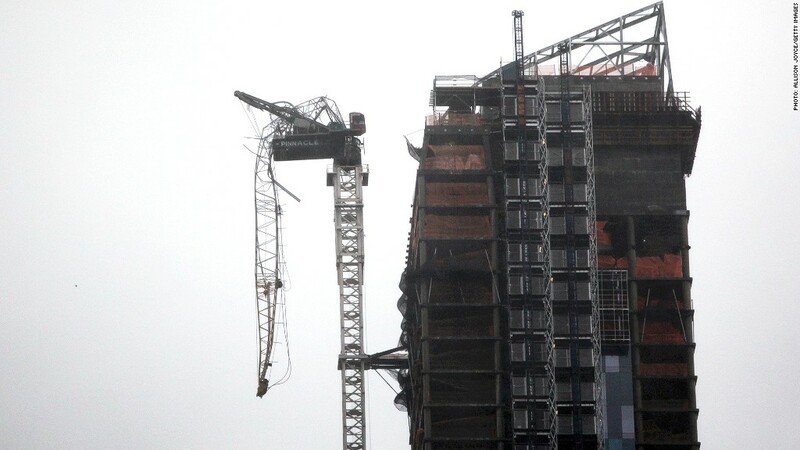 A crane collapsed by Sandy's high winds on the 90th floor of One57 in Midtown Manhattan. It has attracted billionaire buyers and plenty of media buzz, but this kind of attention the developers of One57, New York's soon-to-be tallest residential building, certainly don't want. All eyes are on the scaffolded high-rise as a crane hangs precipitously from its 90th floor. High winds from Superstorm Sandy caused the crane to collapse, spurring the city to shut down streets and evacuate nearby buildings. On Wednesday, New York mayor Michael Bloomberg said the ties binding the crane to the building are secure, but added time will be needed to build another crane to remove the damaged one. It's a devastating setback for a building that has led a mostly charmed existence, said Jonathan Miller, CEO of New York-based appraisal firm, Miller Samuel. Earlier this year, an unnamed buyer paid $90 million for the building's more than 10,000 square-foot penthouse, the highest price ever paid for a New York City condo. The penthouse features 23-foot ceilings and a wall of windows overlooking Central Park, which is just two blocks away. Prices for apartments in the 92-unit building start at $7 million. So far 60% of the units have been sold, according to Bovis Lend Lease. The crane operator, Pinnacle Industries, did not answer its phones and developer Extell Development declined to comment and referred questions to the construction manager, Bovis Lend Lease. Lend Lease said in a press release Thursday that it is working with structural engineers and city agencies to secure the crane. Miller said the crane incident is unlikely to affect prices at the building since it occurred during one of the worst storms in New York history. However, if the building's spring 2013 opening is delayed, it could discourage some buyers. "The only question mark is how long it will take for it to go back online," he said. "If it's six months that they can't sell or show, it can take away from their momentum." Luckily, though, few people house hunting at One57 urgently need a place to crash. The upper floors are a virtual international billionaires club, Hong Kong apparel company moguls Silas Chou and his Canadian business partner, Lawrence Stroll, both of whom cashed in big when they took Michael Kors (KORS) public.